Airline mileage promos are a dime a dozen these days, but Alaska’s offering something a little bit different, incentivizing customers to fly the carrier’s partners rather than booking flights on its own metal. Why would Alaska want to do that? Well, the airline offers a very robust frequent-flyer program without serving many international destinations itself, so it instead depends on key partners to serve enough key long-haul destinations that valuable customers don’t wander off to a carrier with a global footprint, like American, Delta or United. 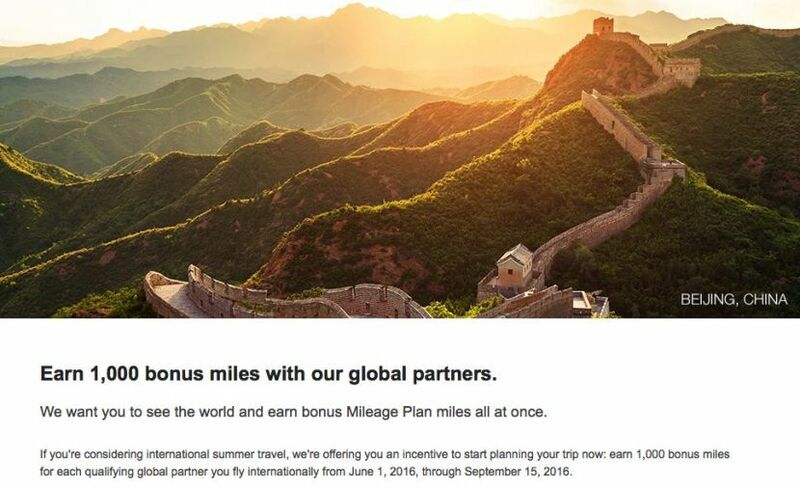 To highlight its key partnerships, Alaska is offering an opportunity to earn up to 13,000 bonus Mileage Plan miles — 1,000 miles for each flight flown with a different partner airline, including Aeromexico, Air France, American Airlines, British Airways, Cathay Pacific, Emirates, Fiji Airways, Hainan Airlines, Icelandair, KLM, Korean Air, LAN, and Qantas. You can earn 1,000 miles each time you fly a new partner airline (and credit miles to Alaska) between June 1 and September 15, 2016. You must fly to an international destination, so while American Airlines flights do count, you’ll only earn the 1,000-mile bonus if you fly AA to or from an airport located outside of the United States. The flight needs to be eligible to earn Mileage Plan miles, and miles don’t count toward elite status. Bonus miles should post within four to six weeks after your eligible flight. You’ll need to register here by September 1. Will you be taking advantage of Alaska’s global partners promo?